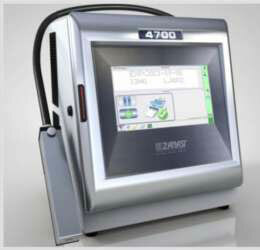 The new Z4700 continuous inkjet printer system conforms to the ergonomic and design tradition of Zanasi. Like all of the Zanasi printer offerings, it has a robust and compact AISI 304 stainless steel IP55 cabinet without compressed air connection and can be integrated into any working environment. The hydraulic system has been redesigned to maintain high quality standards even after prolonged stoppages, to meet the demand for reliability both during standard, as well as more intensive uses, spanning several work shifts. The Z4700 CIJ printer is available in different configurations, depending on the application and adjustable with a variety of fonts and matrices essential to obtain high-quality prints up to 4 lines. It seamlessly integrates into production lines with print speeds of more than 2000 characters/sec. Thanks to the special UHS (Ultra High Speed) software, Z4700 CIJ printers can print up to 400m/min. The Z4700 CIJ printer is based on innovative management software on a stable and flexible operating system, with 10.1″ color touchscreen. A new coding experience with customizable user interface for each operator through language, keyboard and activities (multilevel login). A graphic editor with simple and intuitive icons and stretch and drag & drop functions. Stainless steel structure IP55 suitable for several industrial environments and renewed hydraulic system for assuring high performance. ORKESTRA, New ZANASI management software on stable and flexible operating system. A new coding experience with customizable user interface for single operator and graphic editor with stretch and drag & drop functions. Advanced and versatile integration through Ethernet, USB and serial ports. Rapid and flexible external database management with fixed and variable text field types.